Tower 42, Formerly the NatWest Tower, is a 183m tall skyscraper in the City of London. It was built in 1979 and is still the tallest building in the City. T42 was also the UK's first true skyscraper and was the tallest building in the UK until the completion of 1 Canada Square (Canary Wharf/Canada Tower) in 1990 It is due to be surpassed by the Heron tower in 2009/2010. 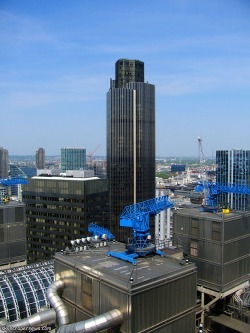 At the time it was completed, Tower 42 was the tallest cantilevered building in the world.